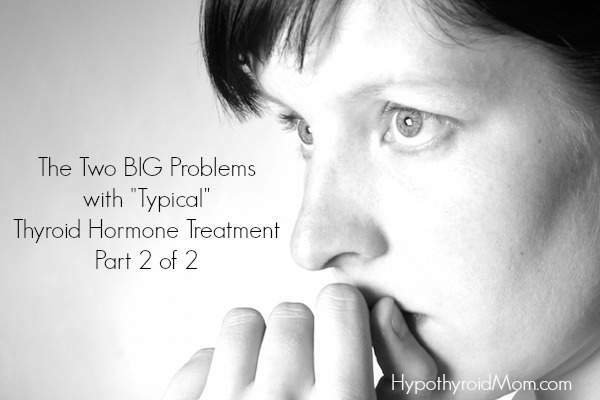 Yesterday I posted Dr. John Robinson’s first part of his two part series The Two BIG Problems with “Typical” Thyroid Hormone Treatment – Part 1. It was incredibly popular with my readers. I think that’s because we are hearing from a doctor who actually gets how to treat us. He doesn’t just sort of get it, he gets it fully. We need more doctors in the world like him. … and how my obsession will help you start feeling better today. Hormones and hormone imbalances affect every part of your life. Beyond leading to life-threatening illness, a general imbalance will negatively affect your physical health, energy levels, emotions and moods. This, in turn, can harm your work, your relationships and contentment with life’s simplest gifts. A thyroid disorder is not always treated appropriately by “traditional” medicine. It is up to you to find a solution that works. In America today, 1 in 8 women aged 35-65 have some form of thyroid disease and over half of these women report depression or mood disorders (source: thyroid.org). Let’s analyze what that means, and you’ll see why I have made it my mission to help alleviate this epidemic. Today, there are approximately 66 million women between the ages of 35 and 65 living in the United States (source: census.gov). That means that over 8 million women in the United States have a form of thyroid disease and over 4 million of these women suffer depression or mood problems as a result. Let me compare this statistic to some other statistics for you, and you’ll realize the scale of the problem we are talking about, and why we have to start using better methods to cure it. The prevalence of thyroid disorders is about the same as breast cancer, yet many seem content to almost pretend thyroid issues don’t need our urgent attention. Remember: Over 8 million women suffer from a thyroid disorder and many of those women have no one they can turn to for an in-depth diagnosis and treatment. Their regular doctor always tells them their thyroid is “ok”, but all the symptoms are still there. I could go on listing comparisons all day, but I think you get the idea. You and I have a big task ahead of us: To help those 8 million American women suffering from thyroid disorders improve their quality of life, find their way to more stable, elevated moods, and attain a higher state of wellness. I have worked for more than 23 years in healing and wellness professions, and as a fully licensed Naturopathic Physician since 2006. Nothing has given me greater satisfaction than to watch hundreds of my patients, through my care, take control of their thyroid disorder. When you attempt to solve a problem with an approach that is “typical” and it is not working, even after multiple attempts, you often need an approach that is untypical. The best approach to thyroid diagnosis and treatment is untypical. This does not mean unknown, just untypical. The optimal approach to thyroid treatment also is not radically new, nor is it something that was recently invented. This untypical approach is in fact revolutionary. The definition of the word “revolutionary” implies a “rejection of a current social or intellectual paradigm” but it also means to “come full circle back to its intended origin.” That is exactly what is starting to happen in thyroid treatment and that certainly is what I have done in how I treat my patients for their thyroid health – with an original, simplistic, rational, effective, and revolutionary approach to diagnosis and treatment of thyroid disorders. For years, from the late 1800s up until the 1960s, doctors would simply observe the patient and through a physical exam, diagnose low thyroid, and treat by giving enough natural desiccated thyroid (NDT) until their symptoms and signs improved. It was straight forward and most patients would have an easy diagnosis and course of treatment. As medicine became more technical, with a tendency towards blood test examination and diagnosis, particularly that of the TSH blood test in the late 1970s and early 1980s, patients started suffering, literally all over the world. Consider this scenario…You are on thyroid medication from your General Practitioner, perhaps Synthroid® (T4), and you still have most of the symptoms of low thyroid – fatigue, weight gain, constipation, dry skin, losing hair and eyebrows, swollen eyes, insomnia, and depression. But your labs are “normal.” Your doctor sends you to an Endocrinologist, where you are hopeful that you will get solutions from a “specialist”, but all she tells you is your labs are normal and Synthroid® is the best prescription to take. You read some things on the Internet about Nature-Throid®, and after begging the Endocrinologist for months, she reluctantly gives you the prescription. You only feel slightly better, but not as good as you know you can. The Endocrinologist does repeat labs and blesses you and says you are on enough medication because your “labs are normal.” She says however, that she could prescribe you Prozac® for your other symptoms. I have heard this countless times. Early on in my practice, I went looking for the answer, simply because I dared to look, and I found that most of this issue was about the right dose. Once a patient was prescribed Natural Desiccated Thyroid (NDT), such as Nature Throid®, and the dose was systematically increased, the patient would quickly improve. Simply increasing the dose to the point where the patient had relief of not only their reported subjective symptoms and how they felt, but other measurable signs such as increased reflex speed, improved Resting Metabolic Rate (RMR), positive EKG changes, and even decreases in thyroid goiter size. In short, I increased the dose until the related low thyroid problems improved. I did this despite what the labs were telling me and simply observed and listened. I trusted my senses, and I trusted the reports from my patients. The average dose for NDT for my patients is from 2 to 4 grains (120 mg to 240 mg). This is the dose that the massive majority will improve symptomatically and functionally. This is consistent with past research and empirical evidence. The reason patients never get to these types of doses is because the conventional doctor only looks at a blood test and bases all truth on that parameter. They will ignore their own senses about patients with low thyroid symptoms and place the blood test value above and before the needs of the patient. This approach needs to stop. I wish I could say this one article would be enough to change it immediately. It’s simple to give the appropriate diagnosis of low thyroid. It’s simple and safe to prescribe natural thyroid medication. And it is simple to increase the dose safely to the point where the patient has relief from their symptoms. And even in the backdrop of other health issues or diseases, possibly complicating the thyroid clinical picture, it is still easy to take a comprehensive philosophical approach to healthcare and provide real utilitarian solutions, helping the patient improve. Due to the massive confusion patients are having as a result of the conventional approach to thyroid and optimal health in general, the need to find an answer, even an intricate and complicated one, is a powerful tendency and a compelling urge. Our medical culture has conditioned us to believe that if medicine is complicated, then it is valid. Patients believe that since they have not had help from highly trained doctors, including Endocrinologists, it is assumed that the answers have to be amazingly complicated and intricate. I do not blame them. This confusion is understandable. But the answers are simplistic. The complicated part, the daring part, is pulling oneself from the veil of confusion that has been created by the conventional medical model and believing that health and your thyroid are based on simple and unmovable laws of observation and rationalism. Just because we suffer a lot, or more than someone else, does not mean the answer to the suffering must be complicated. In fact, the more we suffer, the easier the answers really are. Conventional medicine creates the mystique of something otherworldly and almost magical through the process of complication and the technical. Whether you know it or not, the patient has come to expect this because it has been a large part of our cultural norms. Everything in conventional medicine has been complicated, even the simple things. But when a patient suffers, when anyone suffers, the rational mind starts to demand something more. Something elegantly simplistic that provides abject relief. So much of conventional medicine has moved from observing the patient with their senses to observing the patient with tools that attempt to measure those things outside the scope of their senses, like a blood test. Thyroid blood tests are right at the top of the list. These tests have merit, but not at the expense of the simplistic view and hypothesis that is validated by the senses, by looking, hearing, and touching the patient in front of you. Understanding and appreciating their world will bring the truth forward and then through a rational and compassionate approach, relieve suffering. Blood tests are tools, just as a stethoscope is a tool, but a tool and nothing more. The tool is not the answer, the rational doctor and open patient are the answers. This is how I choose to view a patient and the possibility that their thyroid, for example, is not functioning correctly resulting in a lowered metabolism and altered physiology. And with the knowledge of how a simple and inexpensive medication can so directly relieve their suffering, I move forward intrepidly on their behalf, on your behalf. So, weary traveler, know that you are heard, know that you are validated and there are answers for you. Simple answers, but not too simple. Ihad my thyroid removed in June of this year, but still feeling no better. They keep changing the amount of my tablets. have you any suggestions about how to get my health back after the removal of my thyroid. I have NO thyroid and take Levothyroxine. I take my medication at the same time each morning with water only, and then take nothing for at least an hour. Always, I avoid all soy, coffee, and high-iron foods like spinach. I only drink milk products at night, because they are full of Vitamin D and Calcium. I only take vitamins and D supplements at night. These things helped me.